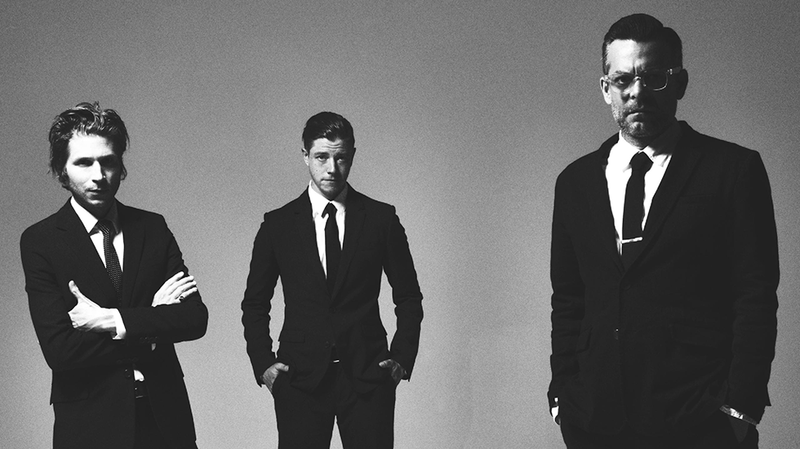 New York City’s Interpol have always been a dark, enigmatic beast, and on their sixth album Marauder out this Friday, they sound at their most unleashed, wild and ferocious. Despite some changes, the band show no signs of slowing down since they strolled nonchalantly into the spotlight, smartly dressed in suits, smoking cigarettes in 2002 with their classic moody debut Turn On The Bright Lights. ALFRED GORMAN chats with guitarist and songwriter Daniel Kessler down the line from Rome about their latest antics. Interpol have just finished an extensive tour (one that sadly excluded Australia) marking the 15th anniversary of Turn On The Bright Lights, playing the album in full. These anniversary tours of classic albums are becoming commonplace, and are often a reason for a band that haven’t done much decent in years to dust off the guitars and go for a nostalgic spin around the globe. Interpol will have no such guff, and upon finishing the anniversary tour, immediately released a new album much to everyone’s surprise. It’s their first since 2014’s El Pintor – the rejuvenated return to form after a hiatus following the departure of bass player Carlos Dengler, who was an integral part of the group. However, Kessler alongside vocalist/guitarist Paul Banks and drummer Sam Fogarino, decided to carry on and have grown more comfortable working as a trio after the decision not to replace Dengler. Brad Truax plays bass on tour, while Banks plays bass during the songwriting and recording process. While competent on the last record, he’s lifted his game on Marauder, becoming more adventurous and prominent with his basslines. The new album overall is more raw and direct, punchy and abrasive, than a lot of their previous work – yet still has moments of sombre beauty and sees the band fully embrace their next phase – helped in part by legendary New York Producer Dave Fridmann (Mercury Rev, Flaming Lips, MGMT, Mogwai). This new Interpol seem fierce and ready for action, having indulged their fans with the retrospective tour, they now have their sights set firmly on the future. It must have been an interesting couple of years for you, having recently finished the Turn On The Bright Lights anniversary tour and also making this new album – a combination of looking back whilst pushing forward. Yeah that just happened to be the timing of it. It certainly wasn’t planned that way, but that’s how things shook out. I think the reason for the tour was we just felt happy to do it, we didn’t overthink the decision, it was an idea that came about and everyone said “Yeah that sounds like fun!” We didn’t look at it as a nostalgic tour. I mean, we were pretty far along writing the new record when we decided to tour. We thought maybe it would be an interesting experience, like a healthy exercise, weirdly enough, to leave these new songs alone for five months. And then we had this great Bright Lights tour and people’s reactions were so much more than we anticipated. Seeing teenagers, to people who were probably there when it came out – it was just something else. It was really humbling. Yeah I bet. I wish I could have caught that tour. So the new album was mostly complete by the time you went on tour? That must have been really interesting to leave the songs and come back to them after a tour playing all your old stuff. And then when you came back and started playing them again, did they feel different? Yeah, when we finished the tour and finally went back and picked up the songs from Marauder, we didn’t know how it would feel. But they felt great and came running right back to us. And that’s when we started to record them. We really felt like – this is the next chapter of Interpol, this is what we want to say. I think when we got off the tour we were tighter from playing live, and felt really comfortable, loose and relaxed in the studio. I think it really brought about some great results. I always find your music takes time to really sink your teeth into and appreciate, but this record has a certain immediacy to it and sounds fresh and different. Another big factor I imagine was that you recorded with Dave Fridmann at his Tarbox studio in upstate New York. It’s the first time you’ve worked with a creative producer since Our Love To Admire. He’s a bit of a legend. Have you been a fan of his work for a while? What did he bring to the table? Working with Dave made us more flexible – we felt malleable and open to possibilities. I think by that point we were very sharp and ready to record, and felt very connected to the songs. We were pretty far along with writing them and were really prepared before we went into the studio. The songs have to feel very alive and present for us to know that we’re ready to document them in a recording studio. We don’t really tend to write things on the fly in the studio, but we also wanted to be open to working with a producer, someone who might help make the songs even better. And yeah when Dave’s name came up, we were like, what would a Dave Fridmann produced Interpol record sound like? He’s made so many amazing records, from Mercury Rev’s Deserter Songs, to working on Mogwai and Tame Impala records – so many records that we love, but not just one sound. We were running a very lively, raw, urgent record. That’s what it sounded like to me in the studio. I wanted to make sure we preserved that. I think Dave was of the same mind frame, and I think that’s what he captured. I think that’s just what happened in the studio, the live and raw sound. I think Dave could hear that from the rehearsal recordings we were sending him. And from that I think he had the idea we should record this whole record to two-inch tape. We’ve always recorded parts of our records to two-inch tape, but then we transfer it to Pro Tools. But he wanted to do the whole thing to tape, so we were like, yeah OK that sounds great. It’s also very frightening because it limits you a little bit, but it limits you in a good way. I think Dave could see that we were prepared and the songs had a strong identity. So once you get comfortable with the process, you get very loose and less precious. For sure, there were definitely some imperfections in there (and I would use that word too) and in the imperfections, they’re now kind of human and warm. I mean, it wasn’t always intentional, some of it was improvised. Sometimes we recorded with a click track, and sometimes we were like, “Ah let’s get rid of that thing”. Whatever feels right in the moment of recording. And as much as Dave has produced some meticulous sounding records, he’s a very punk rock guy. He works incredibly hard. And he knows his studio so well, he can do everything so easily and quickly. He’s a master. You guys get labelled as post-punk and get compared to bands like Joy Division and The Pixies… I would assume they were influences, but who’s someone less obvious that was a big influence on you. We never really talked about influences as a band. We just kinda played music, because I think we had more in common playing music than we did individually. But for me, a huge band that never gets mentioned was Fugazi. They were one of my favourite bands and a big influence. They changed the way I felt about writing songs for sure. Back in the early 2000s, the NYC music scene seemed to really take off and make its mark on the world again. You guys were a big part of that, along with The Strokes and Yeah Yeah Yeahs and a number of others. What do you think was so special about that time, that seemed to give birth to so many great bands? The funny this is, back then we didn’t all know each other that well, we weren’t playing together. We found out about each other in the press. It was a different time y’know, it was pre-social media, it wasn’t so much of a scene. But I guess we all grew together, because we were connected all the time in interviews. Now I know members of The Strokes and Yeah Yeah Yeahs, and they’re friends of mine, and they’re incredible. But back then we were all just doing our own thing.